so WHY is ChecksNet CheckToner the best? there is only 1 supplier that has been tested by banks and businesses around the world, works at cash register scanners, ATM machines, and is even recognized by smartphone apps that let you deposit checks with photos. We can GUARANTEE 100% that this is all true because unlike most MICR toner suppliers, we do ALL our own testing BEFORE we offer ANY new MICR toner for sale. ChecksNet is NOT a MICR reseller. We specially formulate MICR toner for each color or black and white laser printers. Then we print checks and test them with the exact same MICR readers used by banks. Every month we test our MICR toner at ATM machines and with smartphone apps to make sure our MICR works perfectly. Smartphone remote deposits DO NOT eliminate the need to print with MICR toner. We tested printing checks with regular (non-MICR) laser toner: ALL were rejected. Bankers confirmed the requirement for MICR toner for smartphone deposits. Security personnel would not tell us, but we believe smartphone apps detect the unique reflective nature of MICR toner vs. regular toner. 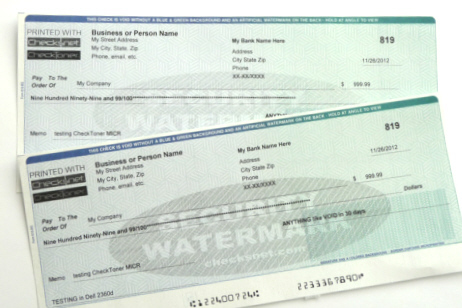 Checks printed with ChecksNet CheckToner work with smartphone bank apps EVERY time. These are the reasons why banks, businesses and even printer manufacturers in Brazil, Canada, Denmark, Egypt, France, India, Italy, Japan, Malaysia, Philipines, Singapore, United Arab Emirates and United States have purchased ChecksNet CheckToner MICR Cartridges for decades.